작년에 기아자동차 광고 시리즈에 사용할 실제 손 크기의 뼈대를 제작했습니다. 이 광고 시리즈에서는 손 캐릭터가 등장해 사람처럼 움직이며 춤을 춥니다. 손가락은 마치 팔 다리가 된 것처럼 움직입니다. 작년에는 퀘이 형제의 작품에 들어갈 아주 작은 손 뼈대도 제작했는데, 그 때에는 힌지 관절을 사용했습니다. 이 실물 크기의 손 뼈대에는 인간과 같은 움직임을 구현하기 위해 볼앤소켓 관절이 들어갑니다. This year, I had some clients asking me to make a hand armature. Earlier this year, I made tiny hand armatures for the Quay Brothers. And last month, I made a real-size hand armature for Kia Motors commercial series. In the Kia commercials, this hand turns into a puppet and dance. Its fingers move as if they were arms and legs. Unlike the hinge jointed hand I made for the Quays earlier this year, I’ve used ball and socket joints for this one to create humanoid-like movements. 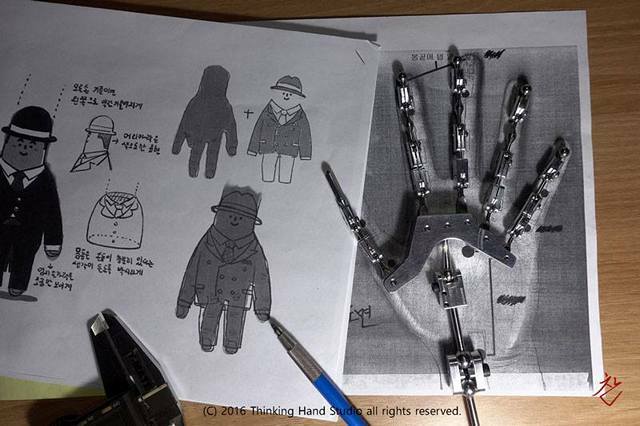 This armature is made based on a real human hand. So its size as well as the positions of its joints are exactly same as the real model hand. While finishing up this project, I once again realized that the human body is asymmetric. When you look at the fingers, you can see that the joints are machined to have curved surfaces. It takes longer time and harder work to machine parts in this way. And tie-downs are hidden in fingertips.